Kaplan's by myself when I was young to have matzo ball soup. Yah, imagine the looks I got. A little Chinese kid walking into a Jewish deli and ordering matzo ball soup. So back to the discussion about kosher. To be "kosher", a restaurant has to go through the trouble of ensuring all their food conforms to the Jewish religion. To further confuse things, some interpretations of kosher allows for dairy products if they come from a kosher cow. However, we did not see any dairy at the Maple Grill. Joining me tonigh t for this foray were Kim, Victoria and Karl. So when one hears the word kosher, there are thoughts of a deli with corned beef. However, at the Maple Grill, there is no corned beef to be found. 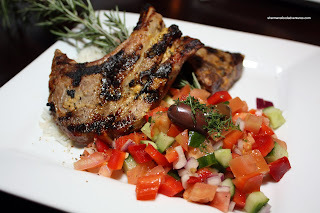 Rather, the whole premise is to mesh kosher with modern cuisine. We decided to share the Hummus and Baba Ganoush to start. Both were served with grilled whole wheat pita bread. 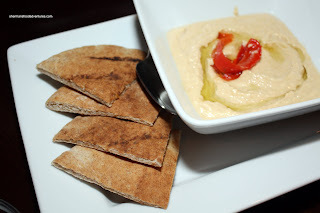 The hummus was not bad retaining a bit of texture (not being over-blended). We felt that it was a touch bland and could've used more salt and a bit of lemon. However, I found the portion that came into contact wit h the roasted red pepper to be quite tasty. 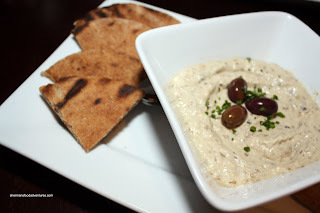 The baba ganoush was also quite decent with good bits of eggplant in a smooth base. Once again, a bit more flavour would've helped put this over the top. If that weren't enough for appies, we ordered 2 bowls of Matzo Ball soup to share. It was described in the menu as being a rich broth. Although the broth was alright, it was hardly rich. Maybe we were expecting more. The addition of dill provided a bit of uniqueness to the taste. As for the matzo balls themselves, I really liked the texture at first; yet as I got closer to the centre, it became a bit hard. 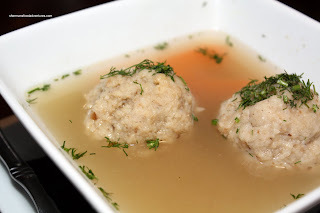 I'm not expert in matzo ball sou p; but for the ones I've had in the past, it was a bit softer. As always, we decided to each have a different entree with different sides. With every entree, there is a choice of 2 sides from a selection of 8. With 4 of us, we ended up trying all of the 8 sides. Interestingly, the sides are refillable, if need be. 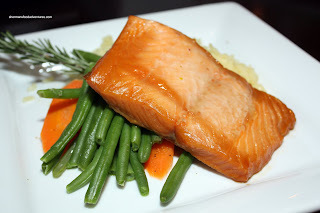 Trying to eat a bit healthier, I went for the Maple Salmon with an orange maple glaze. Before anyone could call it, I claimed the Saffron Risotto. The Steamed Seasonal Veggies were offered to me by Victoria since we agreed that it would look better in the picture. Great minds thing alike! We all felt that the salmon was executed perfectly. Fresh and just barely cooked, there was the right amount of sweetness from the marinade for flavour. As for the risotto, it serves me right for hogging it. It was not very good. I realize the absence of Parmesan hurt the overall texture and flavour; but with that being said, the texture was quite mushy. The steamed veggies were fresh, I wish that they would've been steamed for a shorter period of time as the beans were lacking crunch. Victoria wasn't all that hungry and was hoping to ge t something light, so she chose the most expensive item on the menu being the Lamb Chops. Go figure. Now, as for the lamb, we all thought it executed quite well. The meat was tender, not overcooked and had good charring. For her sides, she went for the Israeli Salad and Basmati & Wild Rice. We all felt the best side hands down was the Israeli salad. It was fresh, vibrant and crisp. Very refreshing. The rice, well, it was rice, at least it wasn't soggy. 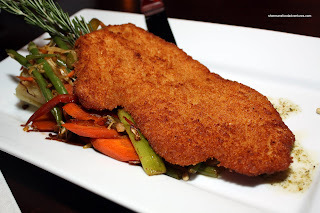 Karl had the Türkei Schnitzel. It was fried up quite crispy and had a nice colour. We only wish that it was more aggressively seasoned or at least have a lemon wedge provided on the plate. Interestingly, there was a Szechuan Stir Fry as one of the side choices which Karl selected. Too bad it wasn't really Szechuan. If there was more spice it could've passed as such. His other side, the Garlic Mashed Potatoes, were alright; but there was a lack of garlic flavour. Kim had the Mezurashii Ahi Tuna and I personally liked the presentation. It was seared with a honey soy glaze (which I really didn't taste) and topped with a fruit salsa and black sesame seeds. The tuna itself was seared perfect wit h a beautiful rare centre. As for his sides, the Rosemary Potatoes were okay, they could've been a bit more crisp. The Roasted Red Peppers were pretty good being sweet and slightly smoky. 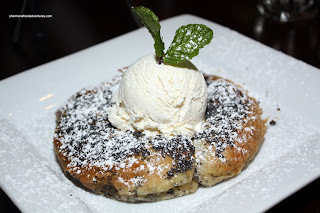 At the end, we shared a Poppyseed Ring with soy ice cream. I thought it was pretty good being soft and hot from the oven. 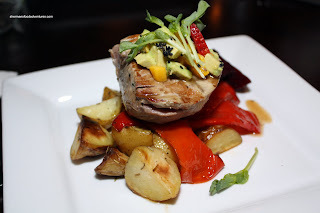 Our meal at the Maple Grill was mostly decent with perfectly executed proteins. However, most of the sides need a bit of work. Furthermore, more aggressive seasoning would bring most of the food to life. 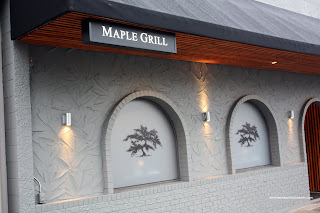 I personally believe that with a few tweaks, the Maple Grill has potential and fills a niche. Thanks for organizing this. "Unfortunately", we ended up agreeing a bit too much, hehehehehe. interesting how the lack of dairy really impacts the flavour of the dish, alot of cultures really rely on dairy such as cheese, butter, cream etc.. however there is a distinct lack of dairy in asian food and it tastes awesome! whats up kosher cooks? I suppose that Asian food doesn't depend on dairy as much? I'm not sure really. However, there is a distinct disadvantage trying to make mash potatoes w/o butter, ice cream w/o cream and risotto w/o cheese. Kim, I think when a bunch of us "agree" then it's pretty much a comprehensive evaluation of the food. wow, that salmon looks great. i wonder how well a kosher restaurant in vancouver does. were there many other people there? Hi Trisha, the place was actually quite full. There is a large Jewish community in Vancouver, particularly Oakridge, which is nearby. In fact, I grew up in Oakridge. We were actually the exception at the restaurant since a large portion of the diners were Jewish. That in itself leads me to think it will succeed since it fills a niche where it's certified Kosher while serving some very non-conventional dishes associated with Kosher. Yes, there are around twenty five thousand Jews living in Vancouver. That being said, the majority do not keep a kosher diet. Maple Grill had to be a restaurant that attracts both Kosher and Non-kosher eaters, and having eaten there multiple times, I think it does this quite well!